For Immediate Release: Posted On 9/28/2018 By Industrial Magnetics, Inc.
Industrial Magnetics, Inc. recently released a video demonstrating their new Magnetic Squaring Arm for press brakes. The product gives operators the ability to make angled corner bends on small pieces of metal with increased speed, accuracy and safety. Designed to quickly attach and detach to a flat surface die using powerful rare earth magnets, the product features a sturdy, stainless steel table with a squaring arm that helps hold and align a metal piece entering the press brake, keeping hands and fingers clear of danger. 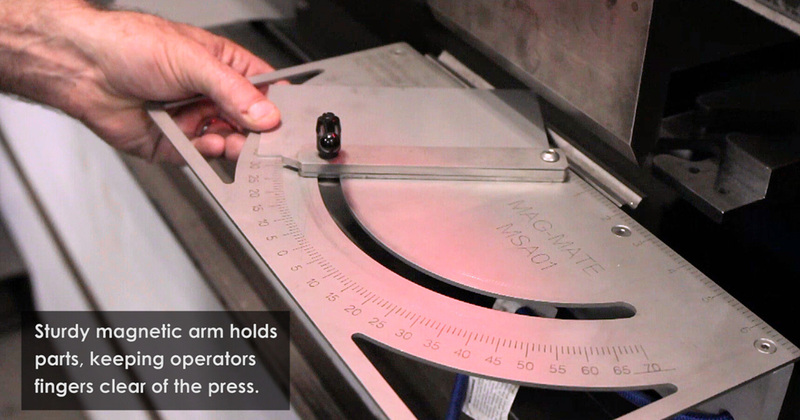 The video is available on the company’s YouTube channel at: Youtube.com/user/MagVids, or on the Magnetic Squaring Arm for Press Brakes product page.